Broadstairs Blues Bash is a FREE Blues music festival which is now into its eleventh year. It takes place annually in mid-February in the Victorian sea-side town of Broadstairs in Kent, England, UK. In 2018 there were 61 local, national and international Blues acts in 14 venues in the town and the festival attracted several thousand people. Due to this year's success, 2019 promises to be even bigger and better with more venues and acts coming on board. Broadstairs has a vibrant exciting music scene and with small intimate wine-bars, friendly pubs and bars, larger pubs and one ticketed (250) venue, it is the ideal town for a Blues festival. 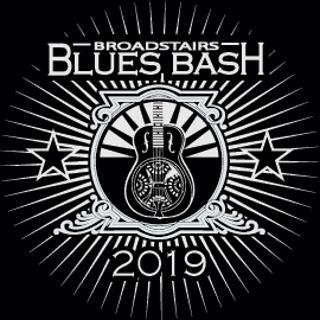 The Broadstairs Blues Bash attracts high quality performers, so if you're a fan of old Blues, new Blues, GREAT Blues, this festival is definitely one not to miss. Please buy a T Shirt/ badge etc. There is a free jam in the Pavilion on sunday noon til 4pm. Bring your boots along, you might get a game. Can I download the logo?